Amazon never ceases to absolutely stun both investors and casual observers, like myself, of the online retail market space. With the release of the Kindle, and now the soon to be Amazon Android tablet, the company continues to create outlets for more people to consume more products faster. And with the mobile internet becoming faster and more stable – at least compared to say 5 years ago – creates an ever growing environment for Amazon to dominate and grow their online retail business. 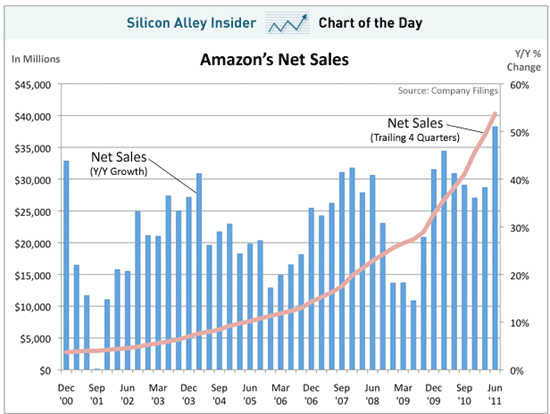 The chart below shows you exactly what I’m talking about in terms of growth, profitability, and future sales predictions. Amazon reported their year – over – year sales figures, and it shows the online retail giant’s sales figures at a 10 year high. With Amazon breaking through a 10 year record high with online sales, the stock price (NASDAQ:AMZN) was up dramatically today, closing +8.34 (3.89%) at 222.52. This stock price growth also outpaced the overall NASDAQ which closed down today -2.65% at 2,764.79. However, in after hours trading, Amazon shares have taken a bit of a dip, they are trading currently at 222.35 -0.17 (-0.08%) in after market hours.